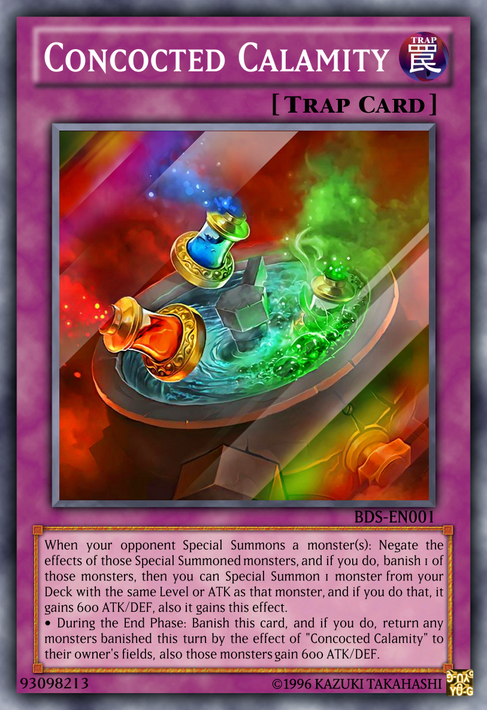 Lore: When your opponent Special Summons a monster(s): Negate the effects of those Special Summoned monsters, and if you do, banish 1 of those monsters, then you can Special Summon 1 monster from your Deck with the same Level or ATK as that monster, and if you do that, it gains 600 ATK/DEF, also it gains this effect. • During the End Phase: Banish this card, and if you do, return any monsters banished this turn by the effect of "Concocted Calamity" to their owner's fields, also those monsters gain 600 ATK/DEF. Better Trap Hole (specifically, Void) that even gives you a souped-up monster, but returns the opponents monster on the field if you can't put it off the field before the End Phase. I should probably give a caveat to this card to make sure you can put back the monster removed if you decide NOT to bring out another monster, but that might end up cutting into the card's potential. I may, but I'll need your input as to whether I simply return it to the field under your Set control (without it being able to flip face-up) or by allowing the opponent to Set something of their own from the Deck to THEIR field. Your choice lads. Till the next card, reviews, revelry, you know the drill.